July 27, 2014  The cyclist had dominated the Tour, wearing the yellow jersey through all but two stages of the grueling three-week competition. July 26, 2014  The 29-year-old cyclist will become the first Italian to wear the yellow jersey into Paris since Marco Pantani in 1998. This year's event was marked by favorites dropping out early on. July 23, 2014  Tour de France cyclists need to eat up to 9,000 calories a day to maintain their health and weight during the race. But many teams hire chefs to elevate the meals to gourmet status. July 14, 2014  Alberto Contador apparently hit something in the road, sending him into a crash so violent that it tore his shoe apart. July 9, 2014  After falling twice in treacherous conditions on today's stage of the bicycle race, Chris Froome is forced to abandon his quest to repeat last year's victory. August 21, 2013  Hundreds of samples taken from riders in this summer's Tour de France found no signs of doping, officials say. 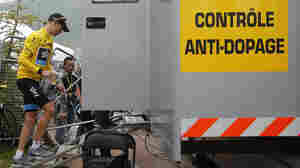 Anti-doping authorities plan to keep the samples for eight years, possibly to test them again. July 21, 2013  Organizers feared this year's Tour wouldn't generate the excitement of previous years. Not so. July 12, 2013  Citing the inclusion of women at the world's top marathons, the petition's authors say, "After a century, it is about time women are allowed to race the Tour de France, too." June 29, 2013  The pileups were predictable. But a bus getting stuck under an arch at the finish line was not. It was moved out of the way just in time for the first stage of the Tour to be completed. Germany's Marcel Kittel was the leader after Day 1. 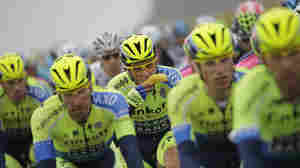 Tour De France: A Fresh Start For 100th Race? June 28, 2013  Last year's champion, Bradley Wiggins, is out; Chris Froome is in. 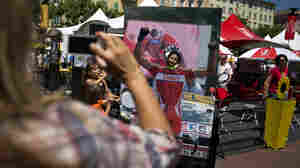 There's also a changing of the guard for American riders, foremost among them Tejay van Garderen, 24, who won the white jersey as the Tour's best young rider last year. April 23, 2013  The department filed a lawsuit Tuesday against the disgraced cyclist who earned millions through his sponsorship with the U.S. Postal Service. 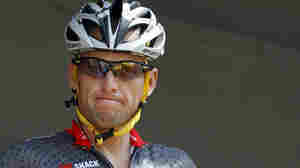 According to The Associated Press, Armstrong's attorney called the government's complaint "opportunistic and insincere." January 17, 2013  In an interview with Oprah Winfrey, Lance Armstrong said that he blood doped or used banned substances in all of his seven Tour de France victories. He also said he didn't believe that it was possible to win seven titles without using drugs "in that culture." January 17, 2013  If Lance Armstrong's doping confession is as complete as many believe, he could be exposed to new legal troubles after his interview with Oprah Winfrey airs. At least one lawsuit accuses the disgraced cyclist of fraud. That suit and others could reduce Armstrong's net worth, estimated at more than $100 million. 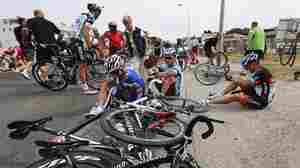 October 12, 2012  The evidence against the cyclist has "called into question a system and an entire era which remains stained forever," says Tour de France director Christian Prudhomme. He doesn't want to see the second-place finishers in races Armstrong won be given those titles. August 23, 2012  The seven-time Tour de France winner said he was tired of fighting "outlandish and heinous" accusations of drug use. 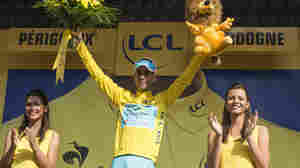 The U.S. Anti-Doping Agency said it was stripping Armstrong of his titles and banning him for life.